This LGR 2800i dehumidifier by Dri-Eaz is a low grain refrigerant dehumidifier. It is the ideal moisture removal tool for water damage restoration, removing up to 25 gallons per day, under optimum conditions. With its low grain refrigerant, the LGR 2800i can remove more water from the air than standard refrigerant designs. This advantage helps the LGR 2800i create conditions with extremely low specific humidity. It will actually pull water out of difficult places and materials to dry subfloors, framing materials, and drywall, not just your carpet and pad. That helps to ensure that the entire flooded area will dry completely with reduced chance for growth of mold or mildew. The Dri-Eaz LGR 2800i comes with an automatic pump out system that includes a 40 foot drain hose. You can pump the water out to a nearby drain, sink, toilet, or even outdoors. The 25 foot power cord, along with the 40 foot drain hose, allows the user a large range of water recovery. Not only will this model dry a 1000 square foot room in less time than several conventional refrigerant dehumidifiers, but it can also be used in combination with one of our moisture detection tools. With something like the QuickNav moisture monitoring system, you can monitor and record each individual room performance for insurance reports. 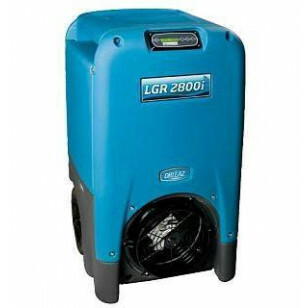 The LGR 2800i may not process as much CFM as some of our other conventional commercial dehumidifiers, but they are unable to lower the specific humidity to the level that one LGR dehumidifier can reach. To improve the efficiency of this dehumidifier, we recommend using several air moving carpet dryers to help move air around the room that is being dried. 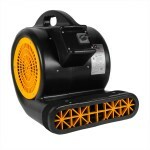 This will force the dehumidifier to process more air, at a quicker pace. We also have axial flood dryers available, which pull extremely low amps, and can be daisy chained together for even faster drying. Removes up to 25 gallons a day of liquid, under optimum conditions. Super convenient size is extremely portable, weighing only 160 pounds. Rugged rotomolded housing with semi-pneumatic wheels make the LGR 2800i extremely portable. Electronic touch-pad controls make this Dri-Eaz dehumidifier very simple to use. Built-in ring allows for easy attachment of ducting for focused drying. Low grain refrigerant with patented heat pipe technology removes more humidity than conventional dehumidifiers. Dri-Eaz® Vortex Sto & Go Ducting - 25' x 12"
This is a review for the Dri-Eaz® LGR 2800i Commercial Dehumidifier - 25 gals/day Max Removal.